Anmol KC & Pradeep Khadka is the most popular young star of Nepali Film Industry. Anmol KC has taken up to Nrs 40,00,000 ($35264) for the movie sign. These both starred all movies have been successful in the Nepali box office till now. 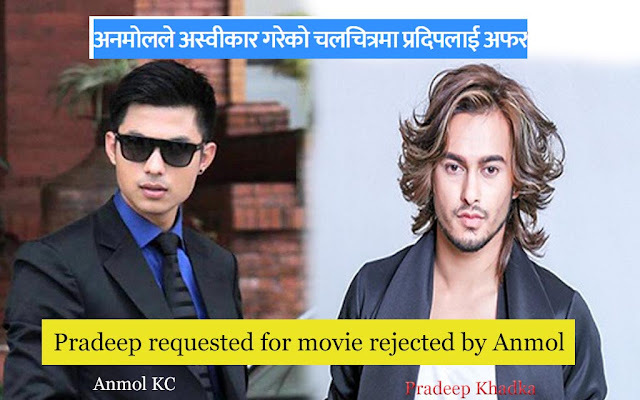 Recently, Actor Pradeep Khadka for the movie 'Bachelor Banti', requested to play lead role After rejected by Young Star Anmol KC . Shortly ago, Kollywood Young Star Anmol KC Dined to play in the movie 'Bachelor Banti', Director Milan Chams sign actor Anmol in the film by giving the money according to his demand. But after reading the movie script and story, Anmol said that he would not work on the movie. He said that i did not like the movie's story. Now, Producer Sudeep Khadka has offered to Pradeep Khadka for the movie. But Pradip Khadka has not given any response for movie. it seems less Possibility to work on this movie because Pradeep has already been signed another 3 Nepali Movies.